Nanking Cherry or Prunus tomentosa is a beautiful winter hard flowering shrub 2-3m high that produces red fruit with a refreshing flavor somewhere between sweet and tart. 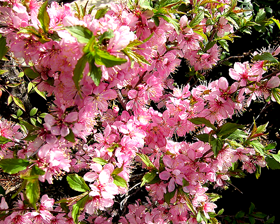 In the spring the Nanking Cherry is covered with beautiful flowers, making it a beautiful addition to your garden. The pinkish white flowers and subsequent fruit are borne in such profusion as to practically hide the stems. 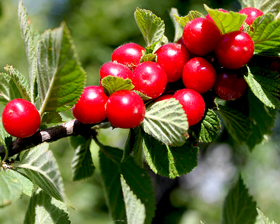 Since the Nanking Cherry is a shrub, it can fit into parts of the garden where a standard cherry couldn't grow. It is excellent for canning, jams and pies. Sow late summer to autumn direct on the surface of a good seed compost and gently firm down. Keep damp but not wet. Spring sowing requires 2-3 months stratification at 2-3C.